I feel like Taylor should be the one writing this post, as this one is his creation, I can take no credit whatsoever beyond taking the picture. 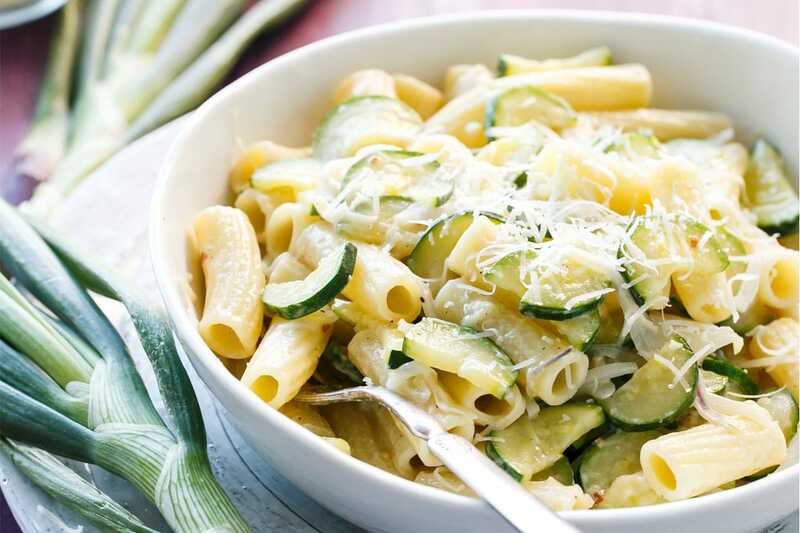 It was one of those nights where I was feeling kind of blah and when I’m feeling blah, all I really want to eat is plain pasta with butter and parmesan (you know, the powdered kind? Sometimes it’s exactly the comfort I crave). Anyway, it was one of those nights, and while Taylor usually obliges my comfort food cravings, on this night in particular he was craving something a bit more… interesting than just plain pasta (I don’t blame him). Fast forward 30 minutes later, as I’m sitting down to my beige plate of plain pasta piled with powdered cheese, and he sits down with.. this. Needless to say I was a teensy bit jealous. 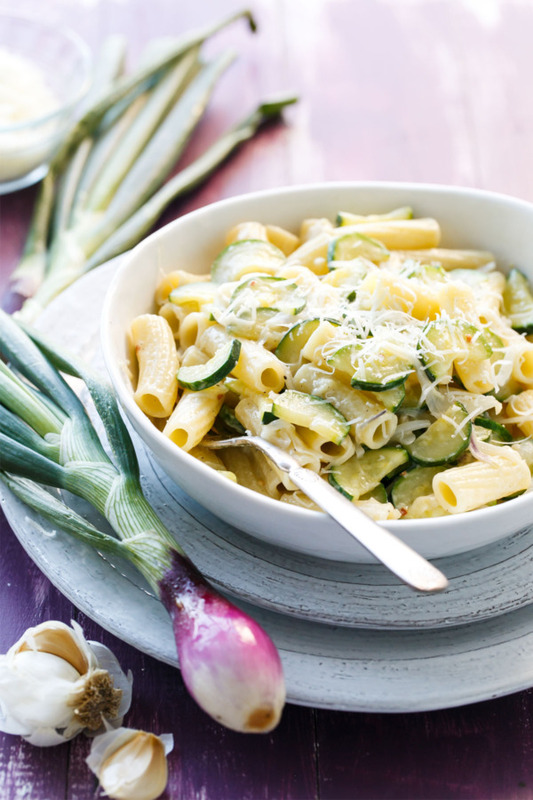 The pasta features loads of garlic, sweet red spring onions (which have a more delicate flavor than a fully developed red onion, sweeter and milder), tender early-season zucchini, and a pinch of red pepper for spice. Finish it off with a splash of half and half and a drift of grated pecorino (powdered parmesan’s more mature cousin) and you have yourselves one delicious dinnertime meal. Don’t you wish your husband could cook like mine? 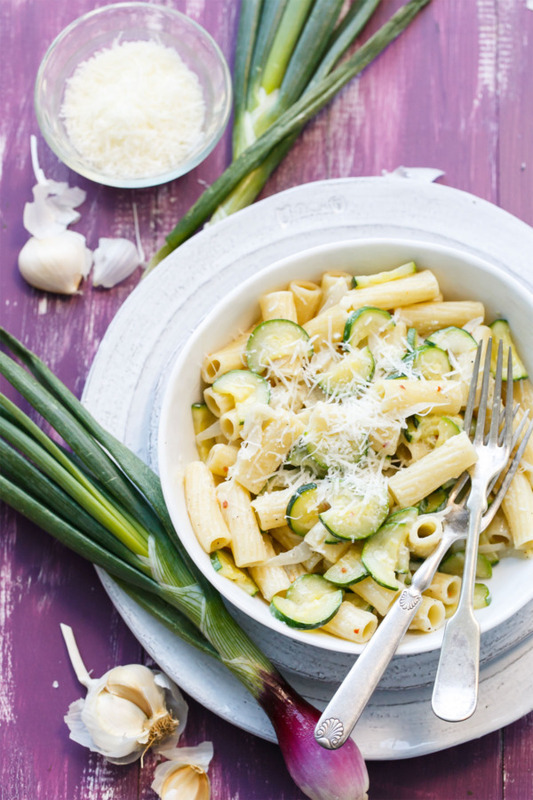 Quick and easy to prepare with minimal ingredients, this lightly creamy pasta features sweet spring onions and buttery zucchini squash. Bring a large pot of salted water to a boil. Add rigatoni and cook to just barely al dente, usually about 1 minute less than what the package says (it will finish cooking at the end). Meawhile, heat olive oil in a large skillet over medium-high heat. Add garlic and red pepper flakes and saute until fragrant, about 30 seconds. Add onion and cook for 2 minutes until translucent; add zucchini and cook for 3-4 minutes until zucchini is just tender; don’t overcook or you’ll end up with zucchini mush at the end. 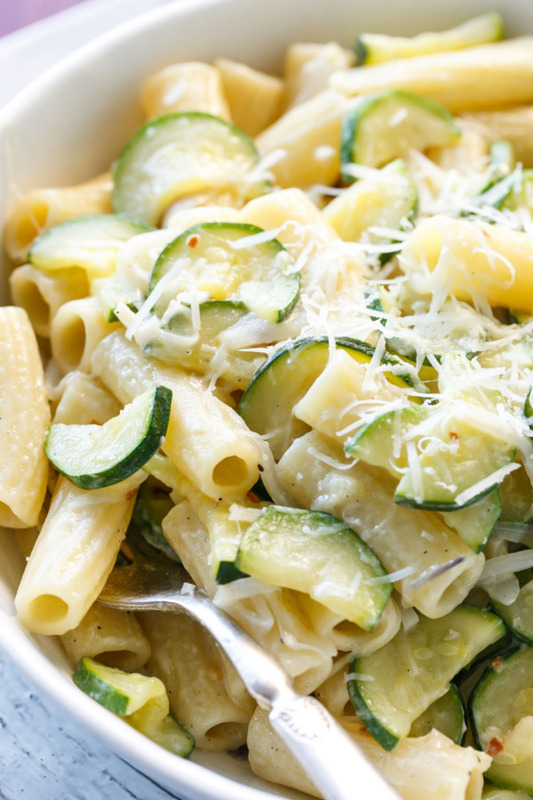 Drain pasta and add to skillet with zucchini and onion and toss to incorporate. Add half and half and stir until slightly thickened, about 2 minutes more. Season to taste with salt and pepper. 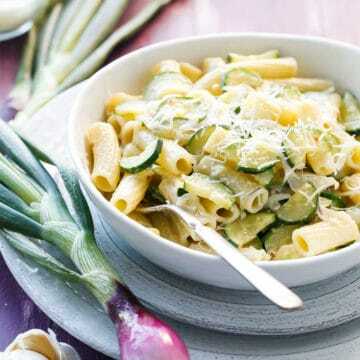 Divide among serving bowls and top with a generous sprinkle of pecorino cheese as desired; serve warm.